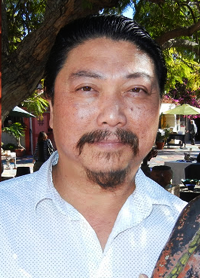 Frederick de la Cruz is a local San Diegan who specializes in the fine art of Raku ceramics. Raku, an ancient Japanese method of firing, provided tea masters with bowls that were simple and unique in beauty. By placing glazed ceramics in kilns at two thousand degrees Fahrenheit. Frederick transforms traditional Raku into a process of artistic expression. The result is a piece that can be described with only one word: Timeless.